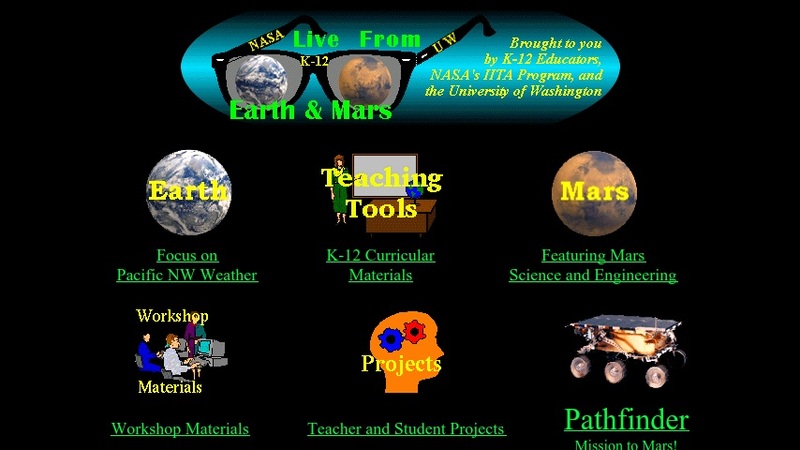 This project, which ran from 1995 to 1997, provides educational materials that use real-time and archived data to explore atmospheric science and the environments of Earth and Mars. The teaching tools page features a series of modules that use data and concepts from meteorology and space science to teach about weather and air quality, the properties of Martian soils, Earth's water cycle, tools and equipment for working in space, and other topics. The Mars and Pathfinder pages provide an introduction to the Martian surface and atmosphere using data and findings from the Viking, Pathfinder, and Sojourner missions. The Earth page includes links to imagery and data on climate and weather. For teachers, there are also workshop materials and an archive of projects submitted by program participants.